Profusion Improved (Malus x moerlandsii 'Profusion Imporved') is an improved, more disease resistant form of profusion. 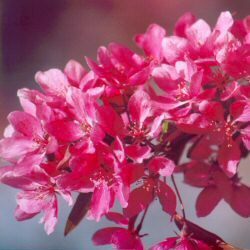 A fast growing crab apple variety, it is noted for its delightful wine-red flowers. This is a small tree reaching a final height of 10m (33ft 4in), so ideal for a small to medium garden. Its young, copper to crimson coloured leaves turns a bronzish-green colour as the season progresses. In turn, the rich, slightly fragranted, purple flowers, change to pink as the seasons change. The crab apples from this tree are small and a pretty blood-red colour. Expect a final height of approximately 4m after 10 years. Profusion Improved is supplied at of height of between 150 - 200cm in a 7 - 12 litre container, which means that the tree can be planted any time of the year and with better results than either bare-root or root-balled trees. If you are interested in other types of Crab Apple Tree then just add the words Crab Apple into the search box and you will see other options available.